Some fibromyalgia patients have two or more sets of eyeglasses because their vision fluctuates over time. They may need a different eyeglass prescription depending on the nature or severity of symptoms on any given day. According to one doctor who has treated thousands of fibromyalgia patients, about half of all sufferers report some type of vision problem. For those who do count vision problems amongst their fibromyalgia symptoms, the complications often interfere with their quality of life. For example, many fibromyalgia patients are sensitive to headlights on the road when driving after dark. This is a form of light sensitivity that may also make it difficult for a sufferer to look at a computer screen, cellphone, or another electronic screen for long periods of time. Even watching television may become uncomfortable or even painful. Some people cannot wear contacts due to excessively dry or irritated eyes, and others may need to keep multiple set of eyeglasses with them at all times. Double, blurry, or unfocused vision may occur at any time, leaving many fibromyalgia patients hesitant to drive or accept jobs that include the operation of heavy equipment. These are just a few examples of how vision problems might impact the quality of life for fibromyalgia patients. Eye doctors may have trouble assessing and treating someone with this condition because they don’t know enough about fibromyalgia to understand the eye symptoms presented. Remember also that trigger points which are often present in fibromyalgia can occur around the face and eyes. Vision can also be affected by migraine headaches. If like me, you have endured chronic migraine since a younger age, you know just how debilitating migraine can be. 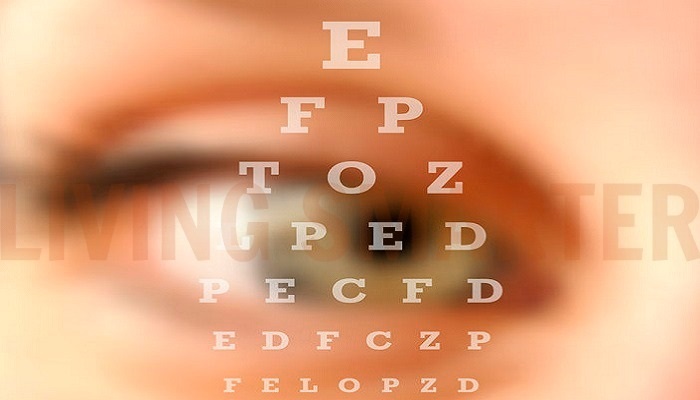 Most vision problems suffered by fibromyalgia patients could easily be assigned to other causes, but that’s not necessarily true with pain in or around the eyes. When you don’t know what is causing a condition, it’s difficult to treat it successfully. You need to always rule out the possibility of another condition all together causing any vision related issues. How about some simple eye exercises? Try these and see if you notice a difference when done consistently. 1. Hold both palms over your closed eyes. Secure them gently around the orbital bone. Allow your eyes to completely relax in darkness for about one minute. 2. Then, take one hand away and use only one eye to look around, look up, look down, and to the side, and then focus on something straight ahead for about 15 seconds, then cover and do the other eye. 3. With eyes open, stretch one arm out all the way and focus on one finger, then focus on that one finger as you bring it in a couple inches towards the face. Extend back out slowly. 2- 3 times each eye and arm. NOTE: do some slow relaxed breathing at the same time ... feels good!! Whether we suffer from eye pain or vision problems or not, it’s good for those of us with fibromyalgia to have our eyes examined at least once a year. If you can find an eye professional with experience treating fibro patients, you might get even better treatment if vision problems or pain do present at a later date. Let me tell you a short story about my last eye exam. During the previous exam, they did a test where they blew a short burst of air into my eyes. I hate to say it, but I really could not stand that. It felt like a little trauma to my eyes and nervous system. So when they got to this part of the exam at the last appointment, I asked if we could go without that part. The technician resisted my request at least twice, however I asked her straight forward "how necessary is this?" and the doctor overheard and told her it was fine to skip that part. Just an FYI in case you also have issue with a blast of quick air shooting into your eyes. There are over-the-counter treatments that may help with dry or irritated eyes, and you may want to limit the amount of time that you spend staring at bright screens. Many sufferers find that blurry vision, eye floaters, and other vision disturbances get worse when they’re sleep deprived, so sticking to a routine sleep schedule may help as well. You might also consider buying glasses that can block the harmful light that comes with computers cell phones. Avoid using your cell-phone while in the sun as the reflection can be harmful to your eyes. Also try to avoid using all devices after sundown to not only protect your eyes, but to increase your bodys own production of melatonin to support healthier sleeping patterns. If you are already taking a good quality fish oil and getting an adequate intake of Omega 3 fatty acids every day, that is a good place to start. Lutein is also an essential nutrient for the eyes, especially as we age and if we have any issues with glare or light sensitivity. Many inferior lutein supplements simply do not contain enough lutein. Remember, that at least 20mg. per day is best. We like and use the Jarrow brand (still cost effective) with 20 mg. Lutein and 1mg. Zeaxanthin (link above this line) Some doctors recommend up to 40 mg. of lutein daily for those over 60. I would say that consistency is also important, because again, I want any supplement you take to be effective AND cost effective. Take what you can afford but in a quality brand, because lutein is an essential as we age. Vitamin K is also known to prevent formation of cataracts. You can check out our information on vitamin K and what you need to know if planning to supplement. With fibromyalgia and the dysruption in the sleep/wake cycle that is so common, comes the additional variable that can easily affect the eyes. With lack of restorative sleep, every part of the body can suffer. You may simply feel like your eyes are not as fully awake and focused as they should be. This can be due to not only fibromyalgia, but chronic fatigue syndrome as well. If you haven't yet, please visit our main sleep help article and consider the suggestions listed.